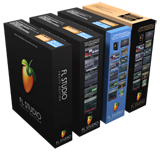 FL Studio Signature EDUCATION Edition is the most complete virtual studio available. Features Everything in the Fruityloops and Producer plus : A complete software music production environment and our commitment to Lifetime Free Updates. ATTENTION : Student card and proof of the school to provide for buy EDU version. Please contact us BEFORE your order! Retail Price - Prix Client : 214,48 CHF tax incl. FL Studio 12 is a complete software music production environment, representing more than 14 years of innovative developments and our commitment to Lifetime Free Updates. Everything you need in one package to compose, arrange, record, edit, mix and master professional quality music. FL Studio 12 is the fastest way from your brain to your speakers. This philosophy is reflected in FL Studio 12’s flexible audio and control data routing, free-form Playlist design and interoperability with industry standards (VST/VSTi/VST2, DXi, DXi2, Buzz, ReWire, MIDI, MP3, WAV, OGG). Didier notes ”We don't try to protect our data & come up with new formats only for marketing reasons. We use existing standards as much as possible, and allow FL Studio be used as a plugin in other hosts“. In version 9, particular emphasis has been given to improved workflow through enhanced interface design, so that ideas can be crystallized and creativity captured.